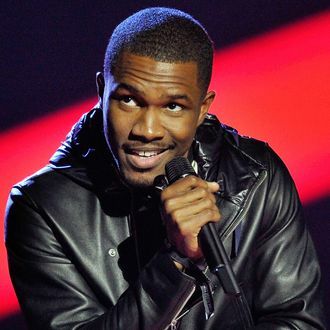 In the wee small hours of Sunday night, Frank Ocean shocked the world by uploading … something to his website. As of this morning, it’s a black-and-white livestream of a room, where some sort of music is playing while Frank saws wood. According to a deleted Instagram post, it’s an art project called Endless from Francis Soriano, who also directed the “Lost” video. It features a boom-box installation from the artist Tom Sachs, who told The Fader the video was filmed “in the past year,” and that he “advised Ocean on some carpentry issues.” Is this finally, finally, where Frank’s going to premiere his new album? Or, as some fans have speculated, is it just a nod to John Cage’s 4’33”? We’ll find out … on Friday, possibly, when the New York Times reports that Boys Don’t Cry will officially be released as a two-week Apple Music exclusive.